Would you like to know one of the most important steps parents can take in order to get their child sleeping through the night? It’s very simple, very easy… and actually pretty fun, too! It’s setting up a bedtime routine. Now, I know you might be thinking “Oh, I already know about bedtime routines,” but stick with me here because there I’m also going to talk about the single biggest mistake that parents make with bedtime routines. TIP #1: MAKE SURE IT’S FUN! Don’t make your child angry at bedtime! Seems like common sense, but you’d be surprised how many clients I’ve worked with who insist on including baths in a bedtime routine — even though their child totally HATES baths! Their mom or sister or friend told them that ALL children need a bath before bedtime, so they just started doing it. But trying to get your child to do something she hates right before bedtime is a flat-out bad idea. Tempers flare… tears are shed… and your child gets so emotionally wound up that it takes MUCH longer for her to calm down and get back into her happy place. So make sure your bedtime routine includes only activities your child enjoys! Specifically, somewhere between 20 and 30 minutes, from start to finish. Well, you want it to be long enough to get your child calmed down, relaxed, and ready for sleep. Plus, bedtime is a wonderful way to spend time bonding with your child. For many parents, it’s the best “quality time” you’ll spend with your child all day! However, if you let your bedtime routine drag on for too long, you risk letting your child get overtired, which makes falling asleep MUCH more difficult! Yes, I know this one sounds “preachy,” but if you’re giving your child sweets (or juice) right before bed, it’s going to be harder for him to fall asleep. Same thing goes for letting a child watch TV right before bed. 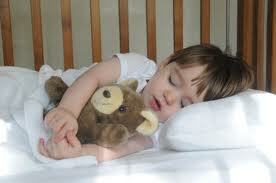 The juice or sweets will give him a “sugar rush” of jittery energy, which is the LAST thing we want before bedtime. And watching TV or playing on the computer can (for lots of children) overstimulate them, so I recommend NOT letting your child watch TV as part of your bedtime routine. As promised, I also want to share the single biggest bedtime mistake that parents make. Letting your child doze off BEFORE you put them into bed. Now, I know it’s tempting for many parents to let their child fall asleep while rocking, bouncing, or feeding. After all, for many babies, this is the way they’ve ALWAYS gotten to sleep. Unfortunately, it’s also the reason why they tend to wake frequently in the night.